Two former Villanova All-Americans fared very well yesterday at the April Fools Half Marathon in Atlantic City. Amanda Marino, 23, who was part of back-to-back NCAA cross country championship teams while at Villanova, took the women's title at the event, finishing in 1:16.06. Marino competed in the 2012 US Olympic marathon trials, and owns a 1:13:47 PR in the event, set at the 2011 Philadelphia half marathon. 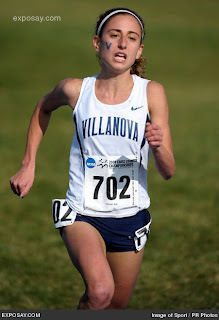 Marina Muncan, a 2012 Olympian in the 1500 meters for her native Serbia, and head cross country coach at Stockton College (NJ), came third in 1:17.27. Ethiopian Woynishet Abebe, a 2:45:32 marathoner (2012 Richmond) came second in 1:16:24.